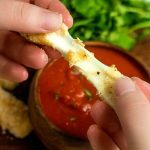 Low Carb Mozzarella Sticks are made with string cheese coated in a crispy, flavorful coating of Parmesan and almond flour and fried to ooey, gooey, cheesy perfection in a Philips AirFryer! In a bowl combine almond flour, Parmesan cheese, Italian seasoning, and garlic salt. In a separate bowl whisk eggs. One at a time coat your mozzarella stick halves in egg and then toss in the coating mixture. As you finish place them in a resealable container. If you have to make more than 1 layer place parchment paper between the layers of mozzarella sticks. Freeze mozzarella sticks for 30 minutes. Remove from freezer and place in Philips AirFryer. Set to 400 degrees F and cook for 5 minutes. Open air fryer and let stand for 1 minute before moving low carb mozzarella sticks to a plate. Note: The Philips AirFryer retains some of its heat for awhile so if you are making multiple batches you'll want to lower the time a little as you go on. We started at 5 minutes for our first batch and then went down to 4 minutes after that.